Shoe Stability Index (SSI) is an indicator of shoe stability, as an index. SSI is derived through mathematically combining the quantified measurements of midfoot stability (TCI) and hindfoot stability (VCI), indicating the shoe’s overall ability to control the motion of the foot. Torsion Control Index (TCI) is a measurement of midfoot shoe stability, in inch-pound units (in.-lbs.). 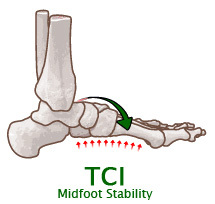 TCI is measured through actively twisting a shoe around the longitudinal axis of the shoe, from the heel to the area of the toes joints, simulating rotational forces of the foot, and measuring the shoe’s resistance to this motion. The higher the TCI, the firmer the midfoot and more torsional stability. The lower the TCI, the softer the midfoot and less torsional stability. Vertical Compression Index (VCI) is a measurement of hindfoot shoe stability, in millimeters (mm). VCI is measured through compression of the heel portion of the shoe under a fixed amount of pressure, thereby measuring how the structure of the shoe controls rearfoot motion. The higher the VCI, the softer the midsole and less hindfoot stability. The lower the VCI, the firmer the midsole and more hindfoot stability. What is Loaded Heel to Toe Drop? Loaded Heel to Toe Drop is the measurement in millimeters of the height of the heel relative to the fore foot when compressed to a fixed poundage. This can be defined as vertical support. Rebound Index (RI) is an indicator of energy return of shoe to the foot, in millimeters (mm). RI is measured through compression of the heel portion of the shoe under a fixed amount of pressure, and then determining how much force the shoe exerts on the foot. Fore Flex is the measurement in millimeters of the fore foot when compressed to a fixed poundage. The higher the Fore Flex, the softer the sole, allowing more bend at the fore foot. The lower the Fore Flex, the firmer the sole, allowing less bend at the fore foot. Characterized by a high arch that remains rigid through the gait cycle Characterized by a moderate arch height with a minimal degree of motion through the gait cycle Indicated by a mild to moderate amount of inward rotation of the midfoot (or "collapsing" of the medial arch) when weight-bearing Indicated by a high degree of inward rotation of the midfoot (or "collapsing" of the medial arch) when weight-bearing, to where the foot appears flat. Compare your feet and water footprints to the images seen above. All pictures were taken in a weight bearing position (standing). Once again, these images should only be used as a casual guide until you can be evaluated properly. The most accurate way to determine your foot pattern is to have a professional observe you walking barefoot. A doctor, physical therapist or a specialty running store should be able to do this for you. Although not perfect, the “water” test can also give you some idea of your foot type. This entails getting your feet wet, walking on dry cement, and observing the prints left behind (see images above). Please remember that foot patterns are defined by the motion of the foot (or lack thereof) through the gait cycle, and not solely the height of the arch. Although the type of heel strike can often be determined by the wear of a shoe, shoe wear does not always indicate the actual foot pattern (which occurs in the mid-stance of the gait cycle, after heel strike).